Overnight Saturday Night: Partly to mostly cloudy skies. Lows in the 30s. Sunday: Mostly cloudy, showers return. Wintry mix overnight. Highs around 40. Monday: AM wintry mix to snow northwest, rain southeast. Light accumulation around Boston. Drying in the afternoon. Highs in the upper 30s. We’re starting the weekend on a very mild note across New England, with highs popping into the 40s to near 50. A few spot showers during the morning south of the Massachusetts Turnpike will move out during the afternoon, with some sunshine developing across the area. Winds will shift to the north and east late day, dropping us into the 20s and 30s tonight. 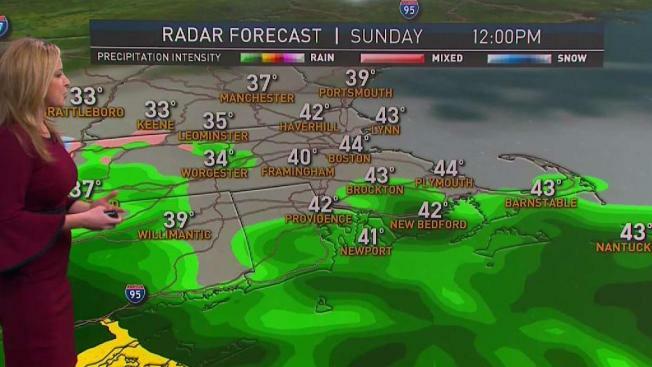 Sunday starts chilly and dry, but another batch of showers works in over the course of the day. It will be cold enough for some of that to turn over to a wintry mix and snow late day and at night, first in places like Western Connecticut and Western Massachusetts, and then in parts of Central Massachusetts and Southern New Hampshire. That wintry mix and snow will even creep closer to Boston during the Monday morning commute, potentially creating some slow downs to start the week. Snowfall won’t be impressive, with just a dusting-1” for most areas from Boston to Worcester, but the timing will be problematic. More like 1-3” is what’s expected along Route 2 in Massachusetts, into much of Northern New England. While the wintry mix ends by midday on Monday for most, mountain snow showers will continue in Northern New England into Tuesday. Some areas there will get closer to 3-6”. The middle of the week, behind this storm, will be bright, quiet, and chilly with highs in the 30s to near 40. Our next storm arrives next Friday as we see it now. Right now this looks more wet than white. A few more light rain or snow showers are possible next weekend into Christmas Eve.